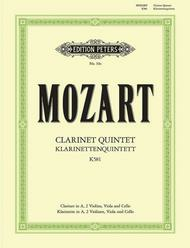 Clarinet Quintet in A K.581 composed by Wolfgang Amadeus Mozart (1756-1791). Mixed Ensemble. For Clarinet in A, 2 Violin, Viola, Cello. Set of parts. Published by Edition Peters (PE.P00019A).Clarinet in A & String Quartet. Music Partner Play-along CD available, see MP 19a.